In our last installment in this Tailor Styles series, we looked at the modern incarnation of the Neapolitan jacket: light and soft, but also short with a small shoulder. Today’s suit, from Sartoria Ciardi, is the diametric opposite within Neapolitan style. It is closer to the original cut developed by Vincenzo Attolini, who re-made the suits of the English to use less padding and lighter canvas, making them better suited to southern Italy. Attolini did not fundamentally alter the proportions, however, and this Ciardi suit hasn't much either. The shoulders are still strong, the body easy, the length easily covering the seat. Indeed, given all the English tailoring we’ve already covered in this series, it will be interesting to compare the Ciardi measurements to those houses. And in subsequent weeks to see how other Neapolitans vary between the twin poles of this and Solito. 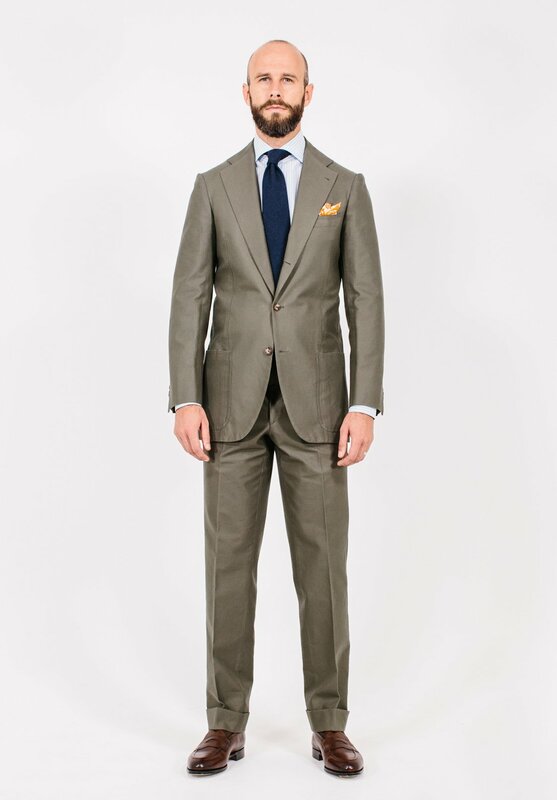 The most important thing to keep in mind with this suit, which Enzo Ciardi cut for me in 2018, is the thick cotton it is made from (Drapers, Cotton & Cotton 4844, 13oz). Cottons are wonderful in many ways, particularly comfort and ageing. But they have no drape. So while the straight lines are nice and sharp (see skirt and vents) the curved lines in the waist or elbow will always be crumpled. They will soften over time, and the colour will fade naturally - but that requires wearing and washing. It will probably even be nicer (but take longer) than lightweight cottons like my Caliendo suit. In terms of style and proportion, the first thing to note with the jacket is its length. 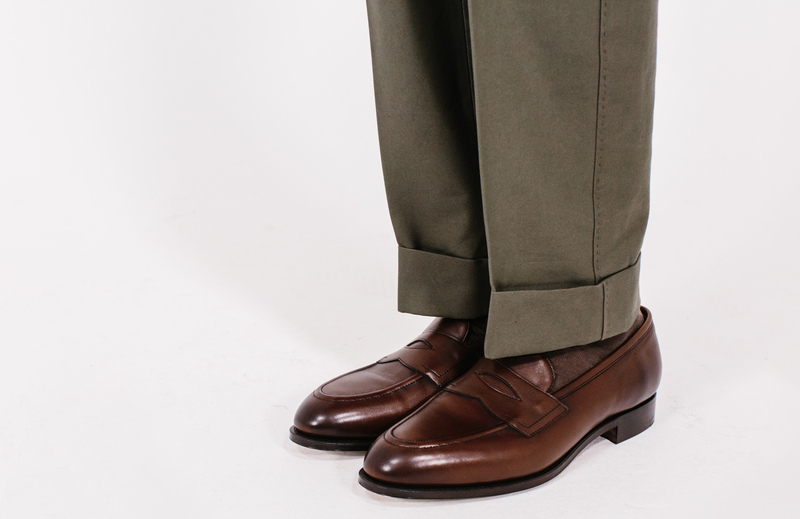 The back seam is 31¾ inches long, more than an inch longer than the more modern Solito. This puts it towards the shorter end of the English tailors (though still longer than Anderson & Sheppard) and around the same as the Milanese like Ferdinando Caraceni. The buttoning point is proportionately lower still, a full inch lower than Solito and one of the lowest we’ve looked at in this series. The next important point is the fit around the body. Few modern Neapolitan jackets have any drape in the chest (excess fabric, adding fullness/strength but also comfort), but Ciardi does. Indeed, if you look at the side-on shot of the suit above, you can see there is little suppression in the waist at all - the back runs in an almost uninterrupted line from top to bottom. This is particularly noteworthy on my body shape, where my larger shoulder blades and hollow back make it hard to avoid some suppression. The upper back also has more drape than most Neapolitans - an effect exaggerated by the stiffness and light colour of the cloth. These factors all contribute to making the jacket very comfortable, while still retaining a flattering impression and ‘X shape’ at the front. Interestingly, the shoulders are not that wide - only a quarter inch wider than the Solito. But this measurement only runs the length of the shoulder seam, from the collar to the beginning of the sleevehead. The bigger difference is the roping on the Ciardi jacket, which effectively extends the line of the shoulder out into the top of the sleeve. Few modern Neapolitans have this, and it adds at least another half inch to the width. As a technical aside, this jacket is also one of the few I’ve had made that has a ‘spalla camicia’ construction all the way down the front and back of the sleevehead. This construction, where the the sleeve appears to run underneath the shoulder, is usually only employed on a smaller section of the sleevehead, and sometimes just at the front. One area where Neapolitan jackets are usually significantly different to their English cousins - but less commented upon than sleeve or structure - is the opening below the waist button. Here Ciardi is again more conservative than Solito, being a little more closed. However, it still retains the roundness of that front edge that you rarely see outside Italy. The comparison is most stark against the Anderson & Sheppard linen jacket (see post at that link). Its opening is actually larger than the Ciardi, but the lines of the opening are much straighter. 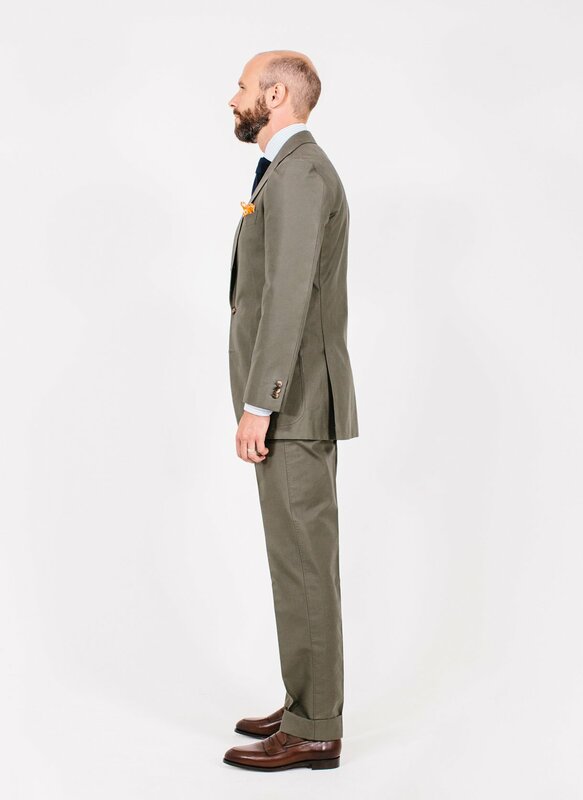 Elsewhere on this suit, the lapel is quite broad at 3¾ inches, and the gorge (the notch in the lapel) quite high at 3⅛ inches from the shoulder seam. The vent is quite long, befitting its length, the sleeve only subtly tapered towards the cuff. It is a slightly more formal cut than the modern Neapolitans and, on most people, a more flattering one. It’s the key reason my first suit from Ciardi was a more business-like four-ply wool. The broad blue-and-white striped shirt is from Luca Avitabile, with blue wool tie and yellow handkerchief from the Anderson & Sheppard Haberdashery. I rarely wear bright shirts or ties with summery suits like this, but tend to add colour in a handkerchief: here a slightly unusual ikat-print cotton. The loafers are the Piccadilly model from Edward Green, in dark-oak antique calf. You can see the full list of posts in this series - which is gradually comparing the cuts of every major bespoke tailor I've used - in the dedicated page here. 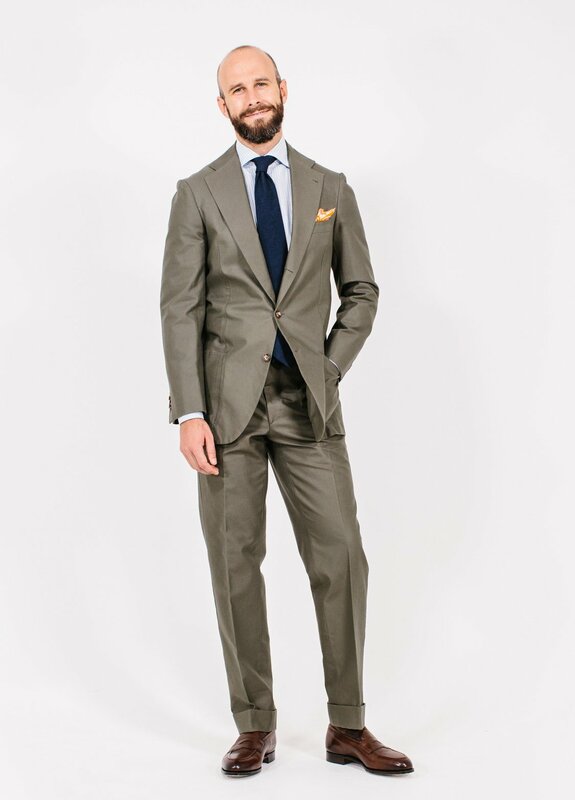 You can follow the discussion on Sartoria Ciardi cotton suit: Style breakdown by entering your email address in the box below. You will then receive an email every time a new comment is added. These will also contain a link to a page where you can stop the alerts, and remove all of your related data from the site. Very nice Simon. Hard to tell the color on a laptop screen, though. What would you say it is, I guess somewhere between grey and light olive? Love the new style of post listing the name, address, price and style breakdown. And the last photo, you look really happy which is nice to see. I’m not sure you know how a smile can make a difference to someone. I’m often in hospital and once when smiling at a total stranger when passing, she came over to me to tell me my smile made her day as no-one smiles in hospital. Very nice suit. The only thing I don’t like is the high gorge; are you happy with it? I don’t mind it, but yes it could be a little lower. As it’s slightly more of a fashion thing I don’t mind some variation there between my suits. I notice the trousers are cut with quite the break, more so than on many of your other trousers. Is this down to their house style or something else? Given that it’s a thicker cotton I assume it will fade very nicely over time, but it looks like this fabric will risk getting shiny rather than matt/faded in worn areas. Perhaps just due to color and lighting in the pictures? Just a small variation in the cut I think. The fit looks right, jacket length a tad too long for my taste but overall looks very balanced and I love the colour/fabric combination. I personally quite like Ciardi’s roping, which in my experience with them complements nicely the cut of their double breasted jackets, although I accept it is not to everyone’s liking. Well done to Ciardi for cutting a lovely suit. A very very nice suit, although I prefer the Caliendo style. I have a couple of trousers from the same bunch, do you think this colour would be good as an odd trouser, to go with a beige linen jacket for example? 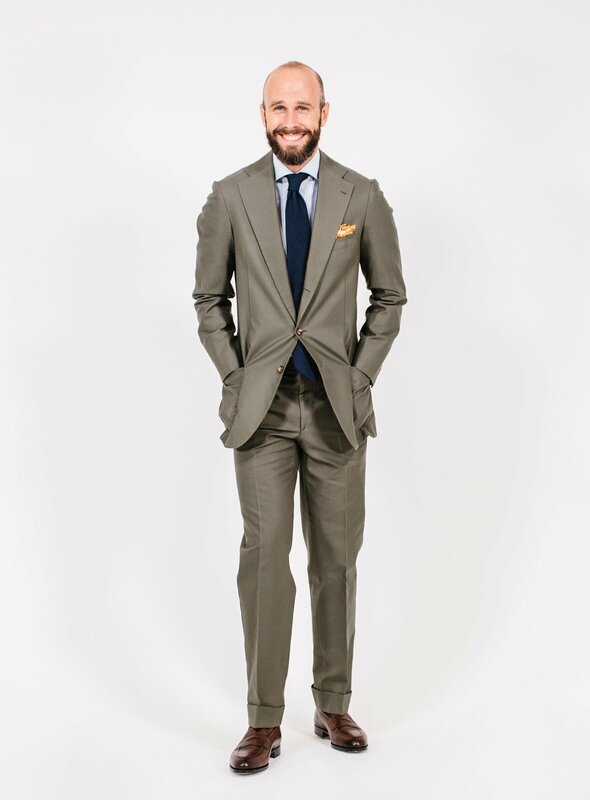 Do you ever get “style fatigue?” What I mean by that is – I often find myself coming to this site (and others like it that are less wonderful) only to see you modeling yet another bespoke suit (cotton, wool, etc. ), or discussing another distinction between regional tailors, or facilitating more discussions about gorges or lapel widths or millimeters of fabric. I love clothing – and the idea of having a signature style – I just wonder if the effect of having a post a day (or three – four a week) is that the reader becomes numb to it all. I’m no fan of Michael Williams at A Continuous Lean – and his commentary is thin at best – but he offers the “less is more” model of only having a new post once in great while. I wonder how others feel about this. You seem to have a new suit, coat, or blazer (or s.c.) every few days. It’s not a criticism – as I love your work and you – it’s more of a personal reaction to something. Maybe I should visit the site less. But I keep coming back. No, it’s a nice point, I know what you mean. I get that more with social media where the volume is so much higher, but could get how someone could get it here as well. I guess it helps if you’re often thinking about one commission or another, or if you have a wardrobe that means most of the style posts provide some kind of fresh idea. I do understand Wes’ point. I can completely see that Nick. I think it has to be seen at this point though – given the size of PS – as more magazine than personal blog, and therefore something that needs new offerings and ideas to show to people. I get more complaints when I feature old commissions where the cloth isn’t available any more, for example. I do regularly also give away pieces I no longer where, which are gratefully received by friends and family. And plan to regularly do sales like the one we did on the Row before Christmas. I’ll just write that I’m slightly in awe of your dedication to replying to all our questions, even on old posts. I think that would fatigue me! Needless to write, it’s very much appreciated and has been extremely helpful to me! Would love to see a post on Cifonelli in this series as part of covering “every major bespoke tailor” that you’ve used. On the Neapolitan tailors scale, would you put this towards the same end as Sartoria Zizolfi? The roping on the shoulder is a bit unusual for a Neapolitan tailor isn’t it? Personally I’ve never cared for the rope shoulder look. Is this type of shoulder just part of the Ciardi style or did you chose this design for a particular reason? Are there any particular benefits to having a roped shoulder versus the more traditional sleeve shoulder? It is for the modern Neapolitans (see the beginning of the piece for comparison of the differences) but not for the older ones, who were more similar to English suits in style. It’s part of the Ciardi style, though they can do a more natural one as well. You say in the text that you have gone for “Spalla Camicia”, but in this reply you are talking about the extent of the roping on the sleevehead. It can only be one or the other, not both. The pictures definitely suggest roping. Also did you choose the lapped seams, or is this just how it turned out? No, the two are different I’m afraid. Spalla camicia only refers to how the seam is created where the sleeve and shoulder join. One appears to run underneath the other, or vice versa. Spalla camicia tends to be made with a natural shoulder, which runs smoothly from shoulder down into sleeve. But it doesn’t have to be, and isn’t here. In the same way, people also tend to associate spalla camicia with ripples or mappina at the top of the sleeve, caused by the tailor putting extra fullness there. But this doesn’t have to be the case either – and wasn’t usually done by most traditional tailors like Ciardi, Panico etc. Thanks for the education on this important point. By the way, that EG penny loafer looks fantastic. I think I like it better than the John Lobb Lopez. Why did you choose this model? I had a pair of EG shoes, but they ended up on my son’s feet more than mine and, as a result, ended up in his closet. I’m a big fan of John Lobb and own several pair, but EG may require another look. In addition to the Piccadilly model, I also like the EG boot the Galway. Discussing all things sartorial is so much fun! If fit was the problem with the EGs, remember every brand will have a slightly different set of lasts (shapes) that will fit your foot better or worse. It’s worth shopping on the basis of those as much as designs. Big fan of the Galway, the most comfortable RTW boot I own. Actually the fit was excellent, but he liked the shoe so much that I gave him the pair. The shoe was a beautiful brown cap toe that I later replaced with a John Lobb version. There’s a French shoemaker named Heshung that makes fantastic boots that you might find interesting, great for outdoor and casual wear. My favorite model is the Gingko, No Man Walks Alone carries the line. Alden, a U.S. shoemaker, makes excellent boots as well that aren’t as rugged as Heshung, but they’re not in the same league as The EG Galway or EG in general. I have to agree that the Galway is the way to go. I love Alden, but wouldn’t wear an Alden boot with any of my suits. Still too chunky for me. Their full-strap loafer on the (narrower) Aberdeen last though, definitely. Several years ago I had made for me an ankle boot from John Lobb called the Tudor that works very well with suits. If they still make it, I think you would really like it. Would be nice with centimeters in brackets for those of us who are impaired in the imperial metric system. 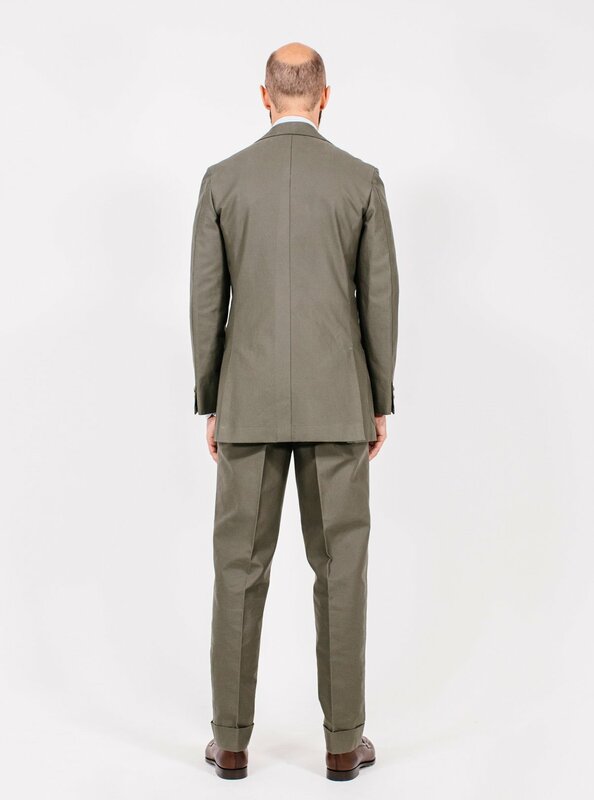 I find, for trouser style and fit, that front rise really alters the overall structure of a trouser (as I’ve seen clearly by my 10” Thom Sweeney trousers versus my 12.5” Edward Sexton). Perhaps you could include this measurement going forward in the series so readers could analyze that effect. Just a thought. Thanks! I think it has quite a flattering silhouette. …speaking as a long term reader: no reader numbness here, Simon’s skill is in keeping the content mixed, interesting and entertaining whilst retaining format and quality – harder than it sounds. Then there is the editorial generosity of hosting the many varied comments adding another layer of detail and enjoyment. Hi Simon, you mention washing the suit: do you mean dry cleaning or is it the intention (unlikely but as it is cotton) to hand/machine wash?Also the top button – ideally how high above the navel do you prefer the buttoning point? (P.S. the ‘dedicated page’ seems to confusingly display with text overlay of title over contents – viewing on mobile). Sorry, on the buttoning point it varies with style and jacket length, as you can see through the series of pieces. It’s partly preference, partly cutting style. Lovely colour. My concern is about cotton fading. On a brown jacket of mine it does not look good at all (it seems the sun took some color away ) and may be even less torelable on a not so casual suit. The cut is nice, not so sure about the fit: the trousers look looser than the jacket, and like on your former Ciardi suit, the rope seems too close to the top of the arm. It looks like a bump, could possibly have been avoided with a larger width. Maybe it is just the picture after all. Yes, I’d hesitate about conclusions on the fit from this, particularly on such a stiff cloth. Fading is a very personal style thing: it happened a lot on my old Choppin & Lodge navy cotton, and I loved that. Everything looks great to my eye except for the silhouette seen from the side. Without suppression and with the cotton fabric, it looks messy. Also given cotton’s tendency to fold sharply, thereby giving little lapel roll, I might have just gone with a 2b instead of the 3r2. All the latter’s adding there seems to be an unused button hole. A minimally-structured neapolitan with harder lines is probably my go-to cut. What do you mean by slightly stooped? Presumably not me standing more or less stooped? How about some dress shirt ideas? Love those EGs. I just bought a pair of Oxfords there. I find the first week of wearing shoes most stressful – before they start to develop a patina I am so precious about the slightest mark! This pair also seem to have a new shoe squeak… Will this go away as the leather gets broken in a tad? It might do – wear them a few more times, and if it doesn’t go away, take them back in. In relation to JB’s comment on the break, I wonder whether the explanation could be (I know, Simon, that you say we should be cautious about drawing conclusions from photographs) the apparently fairly narrow width of the trousers at the cuff? They look as if they could be 7 inches or less. Simon? Thanks for the qualification in there! Yes, it might not be helped by the slimness, but they’re not too slim – see measurement at the bottom of the post. I’m always surprised at the length of your jackets. Most RTW seems to be around 30″ from the bottom of the collar in a regular length. I know you prefer a more traditional length, but it still surprises me that the majority of RTW, regardless of the maker, is so much shorter. Yes I know. It’s the fashion of the age unfortunately. However, there are very rational things behind the range of jacket lengths seen in this series, for example if the jacket doesn’t cover your bottom at all, it sticks out at a rather odd angle. At that length you might as well cut it above the bottom and make a blouson. Also, bespoke tailoring tends to go with the fashions, just never reach its extremes. So jackets have been very long (in the 60s and 70s, in zoot suits) and very loose (Armani, 80s). Right now they’re very short. 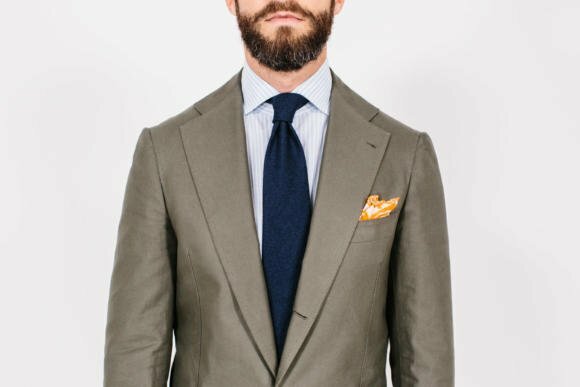 Bespoke tends to moderated versions of these trends – same with lapel widths. Love the suit and especially the sloping shoulders. Are the shoulders an “Italian” thing? I feel I see a lot of “English” suits are straight across the shoulders and make people look like they are sort of standing in a fabric box. That’s probably the extra padding that most English tailors have (drape tailors like Anderson & Sheppard have a bit less). You’ve commissions jackets in heavy cotton from Sartoria Ciardi, Musella Dembech and Ferdinando Caraceni. IMHO all three houses have some interesting similarities; they combine a relatively traditional silhouette with soft construction. Is this a style you think works particularly well with heavy cotton or was the choice more random? More random really – it was more just that I like cottons and wanted to try a certain style from that tailor. What is the measurement of the turn up cuff on the trousers please? Looks relatively substantial, and very smart. It seems everything from exchange rate to tariffs to travel are up in the air…Is there any contingencies you have considered? Is anyone reviewing things with small businessmen such as yourself. Easily half of what Permanent Style is all about involved the EU…. There is some government guidance, yes, but it’s not always that helpful. Most of what we do won’t change – the only significant thing will be some of the collaboration products, which come from the EU into the UK. But then, it’s still far from clear we’ll end up outside the single market. Yet another great suit (I can only assume you have a Narnian size wardrobe) and a delectably nerdy post. However, possibly another photographic trick of the eye, but the circumference at the cuff on these trousers you say is 15 1/4in, however the same measurement on the trousers you wear in the Anderson Sheppard two-button jacketshoot is 17in and appears yet slimmer; on the same shoe. Are these measurements correct ? Is it the fabric? Or just the photo. Many thanks. Hi John. Wouldn’t it be wonderful to have a wardrobe you could slip through into a sartorial world? Yes the measurements are correct, I can only blame photography or cloth I’m afraid. Re. the stooping: yes, if you look at the side view. The question is it stance or fit? I ask as the A& S silhouette is better. My own experience is that, for me, it can be both. Sometimes I can stand badly but it can also be the jacket (the jacket wearing me rather than the other way around). This is usually the cut but I would be surprised as it is Caraceni? It’s worth considering the Grenson boot range too. As owner of both Edward Green and Grenson boots, I regard the latter as fantastic value for money. The leather may not be quite the same quality, but if you’re looking for something English made and rugged enough for bad weather, yet also smart enough to wear under a suit you cannot beat the price. Do have a jacket/suits made by Rubinacci? They will also be included later on in this series. Thank you so much for this series and the entire website. It has been a valuable educational tool for both style and craftsmanship. I have scanned this series, and am having trouble understanding how you measure the buttoning point. Early article allude to a measurement from the “neck point,” but where is that? The reason I ask is that I have had two suits made, and the buttoning point one one suit, to my eye, is an inch and a half higher than on the other – not an insignificant amount for a guy who stands 5’5″. 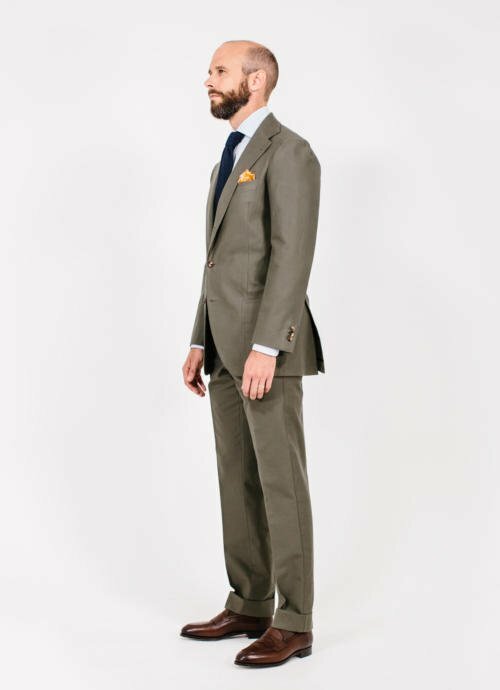 I’m about to order another suit, and I want to make sure there is a difference, and explain it correctly. If I knew where the “neck point” is, I’m sure I can accurately measure to the buttoning point. Thanks to anyone who is able to point me in the right direction. Thank you, Simon. Your commitment to responding to so many comments is as impressive as your site. Beautiful suit. I love the drape but combined with the slightly cutaway foreparts of the skirt and the roped shoulder. It’s also great to see that the jacket also covers your backside. Jackets that expose the unsightly creasing of one’s trousers under one’s “seat” are not to be encouraged. Are the trousers not, perhaps, an inch too long? Not a comment on this post specifically, but I’m afraid there is no better place. I enjoy reading your articles on the phone, but the mobile layout wastes a good third on white space instead of text. Are there plans to change that? Hi Niels. Useful point, thanks. So you’re saying you’d prefer it if the text column was wider? Yes, exactly. While the layout makes sense on a tablet or pc, on mobile I much prefer wall-to-wall text. An absolutely fantastic suit! I love cotton suits and I find they do particularly well with informal Italian styles. A lot of people are skeptical to cotton as a suiting fabric but I think it compares well to linen and traditional wool. It has a distinct look that sets it apart from the others, while still being very wearable in an urban spring, summer and early autumn. Niels is correct, Simon. It’s a real pain trying to type a comment on a mobile. For JJ: the neck point, as Simon details, is at the back of the jacket. It roughly relates to the vertebra prominent (C7) in the spine and generally, is at the base of the collar. Other than its relation to lapel placement it bears little importance to the buttoning point unless you measure the buttoning point from there when the jacket is laid flat. Ordinarily a cutter/tailor will position the top button a few inches above the navel. The navel is usually in line with the lowest rib – the buttoning point should sit above this at the natural waistline. If you bend slightly to the side the ‘crease line’ will mark the waistline. Given your height you might prefer a lower button point on or near the navel. This will lengthen the lapel gorge giving the appearance of a longer torso and thus, visually, a longer frame. Thank you. Your comments on lengthening the appearance of my torso is precisely the look I am after. The lower button point is what I prefer, and will use. Thanks. Re. Niels’ point surely an outward pinch would resize/enlarge the text and decrease white space (works on the iPhone)…? p.s. personally I love the clean look. Simon, in a few of your photos the jacket has an “X” at the front. Is that an indication that it’s too tight? I’ve been wondering, when you give a lapel gorge measurement, exactly where are you measuring to and from? Simon, I have a general question. I am assuming that, like me, your first step in a commission is finding a length of fabric you like. Once that is done, what is your thought process in deciding between single breasted and double breasted? I love both, I wear both, but for every new commission it’s what I perseverate with the most. Simon, thanks for the reply. Is this also the reason why you seem to eschew three-piece suits? That they stand out too much (in a negative way)? I can’t recall seeing you commissioning a vest with one of your suits though I may be mistaken. For some reason I think a suit with a vest seems to stand out more than a double breasted suit, and I find it easier to wear the latter. Do you by any chance know how much Ciardi charge for a jacket ordered in London? Thank you! Is that including VAT? I can’t decide whether a lower buttoning point adds to casualness or rather the opposite.